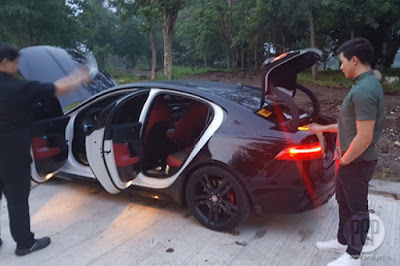 Home / Entertainment / Video / Alden Richards finally rewarded himself with his dream car! Alden Richards finally rewarded himself with his dream car! Alden Richards' reward himself with a luxury car. Watch it here! After those sleepless nights, hectic schedules, non-stop photo shoot and shootings, Alden now finally showed one of the fruit of his labor. Every celebrities sometimes needs also to have their rewards after working too hard for the fans. Last July 3, after Alden attended Vic and Pauleen's house blessing in Laguna, he asked the couple's priest friend, Fr. Jeff Quintela to also bless his new black Jaguar sports car. According to Alden, he has been using his car for almost 3 months now so he needs ot have it blessed by a priest for his safety. It was his really his dream to own a a Jaguar sports car so he bought it and also a reward for himself. After all his blessing since the ALDUB phenomenon started, Alden has been investing now for his future and for his family. He has a newly built house in Laguna near Vic's house, the Pambansang Bae also has a restaurant in Tagaytay, The Concha's, which just opened last May. He also has a farm in Lemery, Batangas. Alden really deserves everything he have now, from his new home to his new car, after all his hard work, all of this are his reward.